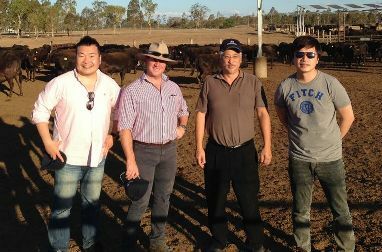 Recently Kerwee Feedlot was host to the annual mission by Kanpai Co., a distributor of Stockyard product based in Taiwan. As part of the visit, Kanpai staff were given a tour of the feedlot by our North Asia sales manager Noble Araragi, Stockyard CEO Lachie Hart, and feedlot manager Brad Robinson. Their time at Kerwee helped to explain all steps of the lotfeeding process, with ample opportunity to see things first hand, and to ask any questions they had about the way our cattle are reared and cared for. One of the highlights was enjoying some excellent Stockyard beef while looking out over the magnificent Darling Downs. Remaining connected with our customers and partners represents an important part of the Stockyard philosophy, and we look forward to welcoming future visitors to Kerwee and Stockyard.